Working with new images is so awesome, because I learn something new every few days. Before I added these images from Godey’s Lady’s Book to our collection from the American Antiquarian Society, I had never heard of Sarah Josepha Hale (1788–1879). Well, let me tell you, the deeper I studied, the more convinced I am than ever what an important role women have played in our society and our art. Hale was, for 50 years, the editor of Godey’s Lady’s Book, the most influential social magazine in 1800s America. Although the 1800s in America is remembered as a period when women were advised to devote their lives to the household, many women made their mark in art, literature, education, and politics. Yeah, women stayed in their homes all right on the frontier, doing everything from farming to gutting animals for food to raising families. Hale was born in New Hampshire. Her mother was her first teacher and passed on to her a love of reading. Subsequently, she was tutored by her brother, a Dartmouth student, and afterwards by her husband, who was a lawyer. After the premature death of her husband in 1822, she was determined to see that her five children were educated, and turned to writing as a vocation. She published several poems to moderate success and published her first book Northwood, a Tale of New England, which was the first American novel published by a woman. She eventually became editor of the “Ladies’ Magazine” in Boston in 1828, and after that, in 1837, of Godey’s Lady’s Book in Philadelphia. 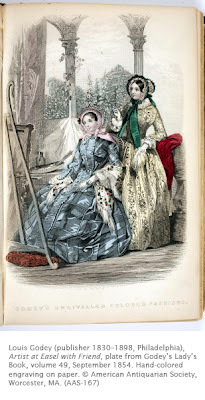 Godey’s was meant to keep women up-to-date on current fashion, mores, and literature. Although the articles and editorials were meant to preserve the woman’s place within the household, Hale pushed many then-radical ideals about women. She was instrumental in the founding of Vassar College for women and was a keen proponent of higher education for women, unavailable at the time. Although she was not for women’s voting, she believed that well-educated women could inform their husband’s votes. 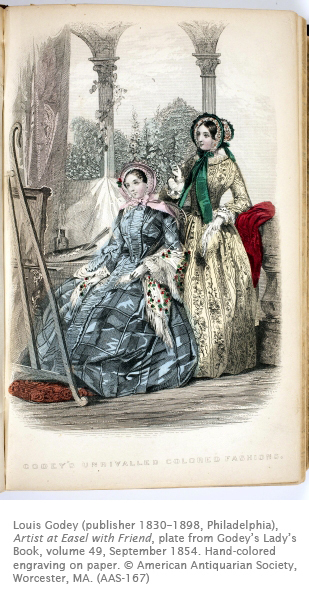 She did not favor the monthly fashion plates, like this example (because she favored more modest dress for women), but she did coin the term “lingerie” for women’s undergarments, which has stuck to this day. Other achievements by Hale include convincing President Lincoln to make Thanksgiving a national holiday. She compiled a book that recognized over two thousand women writers from the earliest recorded history. Godey’s magazine was published at a time when Philadelphia was recognized as the publishing capital of the United States. Another interesting fact, aside the fact that Hale was the first editor of a magazine devoted to women’s issues, was the fact that these fashion plates were hand-colored by—what Godey referred to as—his “corps of women colorists.” This mirrors the fact that most of Currier and Ives lithographs were hand-colored by women. Studio Activity: Design an outfit for a contemporary woman. Carefully consider the kind of woman you want to design for. Draw the outline of a person on lightweight cardboard, paying close attention to the proportions of the arms, legs, and head. Cut out the figure and lightly trace around it on paper. Sketch the features of the clothing on the paper outline and color them with markers or colored pencils, paying special attention to details such as patterns or border designs. Cut out the finished paper outfit and attach it to the cardboard figure, filling in details of the face and hair. Correlations to Davis programs: Explorations in Art Grade 1: 6.33, 6.34; Explorations in Art Grade 3: 1.3; Explorations in Art Grade 4: 1.2; Explorations in Art Grade 5: 1.3; Explorations in Art Grade 6: 1.3; A Personal Journey: 3.3; Exploring Visual Design: 1, 7; The Visual Experience: 9.4.